Alan Moore was interviewed by Stewart Lee on BBC-4’s Chain Reaction; via Didi, I got to the Comics Reporter, which posts a link to the interview that works (the one on the main page gave me an error), as well as to a transcript at CBR. Using esoteric techniques described in Ben Hammersley’s Radiopod script, I’ve used mplayer to download the interview and convert it to a WAV file, and then used lame to convert it to an MP3 (30 Mb, so a bit big, but I uploaded it anyway). Probably so I can listen to it on my MP3 player, I guess, but mostly just to see that it can be done. Update: bonus for Genkin, the three out-takes from the BBC site, in MP3 format: Stewart Lee on playing a Cyberman, Moore on Superman and Mort Weisinger’s neuroses, Why Moore doesn’t like The Killing Joke. Update II: The following week’s Chain Reaction show, where Alan Moore interviews Brian Eno, is also avaiable (MP3). This entry was posted in Comics on January 30, 2005 by Dotan Dimet. Valherjar: The Chosen Slain sounds horrifyingly like a roleplaying idea I thought of (and ran twice in cons). This entry was posted in Roleplaying on January 30, 2005 by Dotan Dimet. Look! Suzie writing in her LiveJournal! Check out (Hebrew). This entry was posted in Blather, short on January 26, 2005 by Dotan Dimet. Meet Troy James Hurtubise, a self-styled “close-quarter bear researcher,” who’s obsessed with going face-to-face with Canada’s most deadly land mammal, the grizzly bear. Troy is the creator of what he hopes is a “grizzly-proof” suit of armour — an extraordinary fusion of high-tech materials and homespun ingenuity — and of his own hybrid mythology that is part Hollywood, part Canadian shield. Although it looks pretty impressive, when you watch the clip you realize he’s basically wearing a huge metal can (with it’s own air-conditioning). This entry was posted in Oddities on January 25, 2005 by Dotan Dimet. I was listening to Natalie Merchant’s album, Motherland, which in general I didn’t find too interesting *, when I came across a curious song called Henry Darger. 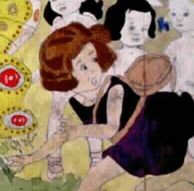 Turns out that Henry Darger was a solitary man, whose artwork and writings were discovered only after his death, when his landlord came to clean out his apartment. Darger wrote and illustrated an epic fantasy story called The Story of the Vivian Girls, in what is Known as the Realms of the Unreal, of the Glandeco-Angelinian War Storm, Caused by the Child Slave Rebellion.. He’s considered a prime example of what is called “Outsider Art”. The idea of someone obsessively writing and drawing a story meant only for himself reminds me of Robert Crumb’s brother in Terry Zwigoff’s film Crumb. * – In most of the songs she sounds too much like Tracy Chapman or Joan Armatrading, which weren’t to my taste back when you couldn’t escape hearing them; Though I did enjoy the songs Golden Boy, St. Judas and This House Is On Fire (particularly the opening).